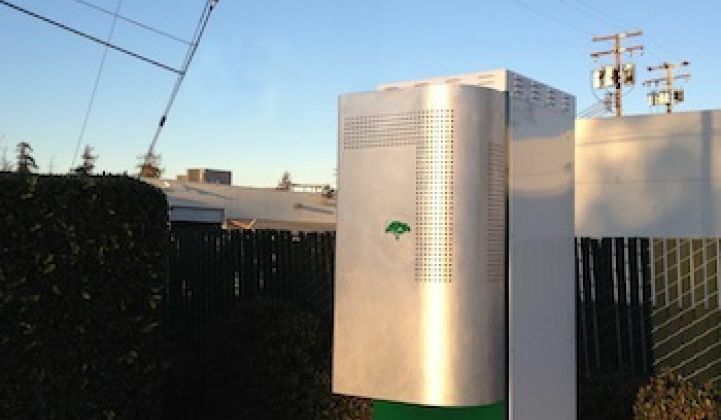 Green Charge Networks, the startup that’s putting batteries in commercial buildings to help shave utility bills and balance the grid, has just joined a small but growing roster of energy storage players trying out a model that’s helped solar PV hit mainstream and which could push energy efficiency to much broader markets: no-money-down financing. On Tuesday, Green Charge and partner TIP Capital announced a $10 million fund aimed at giving customers a free installation of the startup’s GreenStation battery-plus-energy-management system, then paying off the cost through utility bill savings. The program is part of TIP Capital’s broader offering for fixed-rate monthly financing payments for lighting retrofits, HVAC upgrades, and other qualified energy-efficient projects -- now including energy storage. Vic Shao, CEO of Green Charge, said the company is targeting 5 megawatts of installations by year’s end, up from 1.5 megawatts as of this week -- a figure that’s grown by 400 kilowatts just in the past month. Customers include 7-Eleven stores, Walgreens drug stores and an Avis rental car location in New York. The company also added a UPS distribution facility to the list last week. Since its 2008 founding, Green Charge has tapped $12 million in stimulus grants, as well an undisclosed amount of funding from investors including ChargePoint founder Richard Lowenthal, to build out its demonstration projects with New York utility Consolidated Edison. Using systems that range from 30 kilowatt-hours to 300 kilowatt-hours in size, it's been able to deliver average utility bill reductions of 15 percent or more, and with three years of data behind them, "we know they work," Shao said. It’s a similar move to that made by Stem, another fast-growing batteries-for-buildings startup with about 6 megawatts of systems installed so far, mostly in California. In October, Stem launched a $5 million fund with Clean Fleet Investors to boost installations of its own building energy storage systems, and expects to bankroll about 15 megawatts of storage systems through it. Both companies are pushing a model that’s already helped companies such as SolarCity, Sunrun, Clean Power Finance, Vivint and SunPower create a booming new market for solar PV by offering low or no-cost installation, then securing repayment streams from customer energy savings, net metering payments, tax credits and other sources. That solar boom, in turn, is helping to drive growth for batteries to help commercial buildings incorporate their own solar power into energy management. Indeed, SolarCity and cousin company Tesla Motors in December launched their own energy storage financing program, targeted at commercial buildings, to bolster their long-running pilot program putting batteries into solar-equipped homes. But solar isn’t necessary for customer-sited energy storage to pay for itself. What’s really driving the first wave of building battery systems are demand charges. Those are the portions of utility bills that building owners pay when their total electricity consumption hits or exceeds certain thresholds at any moment in time. Because these “peaks” are hard to monitor or predict, they’re hard to prevent -- and in certain markets, like California or New York, they can add up to a significant portion of overall utility bills. GTM Research predicts the U.S. market for distributed energy storage will grow at a 34 percent cumulative annual growth rate to reach 720 megawatts by 2020, driven largely by the demand charge business case, but also boosted by solar integration needs. For example, customers who installed solar PV to reduce energy consumption, but then get moved into rate structures that emphasize demand charges, may want to add batteries to put that solar power to use in capping consumption peaks. Green Charge CEO Shao noted that the company is working with one undisclosed customer that's combining its battery system in the cost of a solar system receiving the 30 percent federal Investment Tax Credit for solar projects. That's an additional boost to state grants available in California -- and soon to come in New York -- that help pay for distributed energy systems including storage. Other customers are backing up plug-in electric vehicle chargers, which can add huge spikes to power consumption that need flattening out, he said. EV chargers are another big capital expense ripe for financing, as ChargePoint is doing under a $100 million fund with Key Equipment Finance. But perhaps the most interesting aspect of Green Charge’s partnership with Michigan-based TIP Capital is in how it brings a new quantity to the energy efficiency field, Shao said. While traditional efficiency retrofits are focused on reducing total energy consumption, they may leave out the matter of peak usage, demand charge costs, and other costly pieces of the utility bill puzzle. Green Charge and other building-installed battery systems provide “what we call power efficiency -- it’s perfectly complementary to what TIP Capital does today with energy efficiency,” he said. “They target kilowatt-hours, and we target kilowatts.” In markets like California, where energy rates have slowly declined while demand charges have risen, that’s a natural addition to energy efficiency offerings -- and one that could give building-based battery systems an additional path to market through traditional efficiency retrofit and energy services players. Indeed, Shao has written a white paper on the subject of power efficiency, calling it the "next frontier" in energy efficiency savings. A host of startups and giant energy services companies are creating new financing models for energy efficiency, in hopes of surmounting existing economic barriers and opening broader and deeper markets for their services. Perhaps it's time to start adding new terms like "power efficiency" to the lexicon.